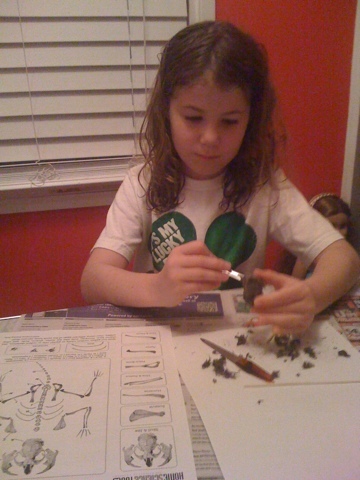 Matilda was thrilled with her owl pellet dissection kit. We decided she probably would enjoy it enough that we got the 5-pellet classroom kit, rather than a single pellet. Luckily owl vomit is pretty cheap from the school science supply company so it wasn't much of a splurge. I underestimated how long the dissection would take and she was very dissapointed when I cut her off tonight for bedtime. The flip side is, she will be equally thrilled tomorrow when she gets up and remembers she's still got half an owl pellet to investigate. Porter has been very patiently watching the whole process and quite accurately guessing bones using the skeletal anatomy chart.